Drive safe and legal by keeping your Android or Windows Smartphone in a secure and easy view position with this flexible microUSB NFC enabled car-dock. Use GPS directions, easy access to music & more. Optimal reception with the handset in an upright position above the dashboard line. Now offering the Ultimate bundle pack with 3 of our best mounting options. Compatible with Android and window handsets with a center charging connector. Example: Samsung Galaxy S7 / S6 / Note 4 / Note 5 / S5 / Active / S4 / Galaxy mini , Droid Maxx, Moto X , Droid mini , Driod Turbo , LG G3/ G2 / Lucid 3 / Vista / Enact , 8x Windows , Nokia Lumina , Nexus 6 , BB Bold . DRIVE SAFE and LEGAL Super convenient to drive with your Android/Windows in a secure and easy to view position using the iBOLT microUSB NFC car mount. Many different placement options as VentKlip, Suction Mount AND miniBall mounts included. 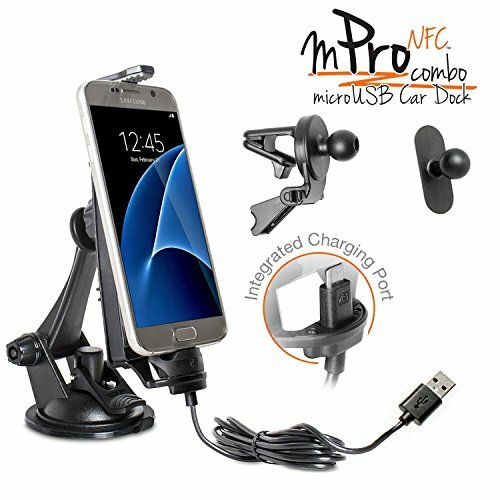 INTEGRATED CHARGING CONNECTOR: The mPro is the first real car dock for Smartphones with bottom centered microUSB port. Simply slide onto the Dock when stepping into your car; no more "fishing up" a cable from the floor. Keep your car interior neat. CASE COMPATIBLE: With the unique and patented design of the mPro Dock virtually every model of Protective Cases can be used, including Otterbox Defender type Cases. COMPLETELY FLEXIBLE: The spring loaded latch can be set to different heights, fitting handsets from the size of Samsung Galaxy S4/5/6 up to the large LG G3/G4 or NOTE 3/4/5 (all with thick or thin Case). Built-in NFC tag can launch the free premium App "Dock'n Drive" that turns your Phone into a virtual driving assistant. With the 17 mm ball joint alternative mounting solutions made for Garmin and others can be used. Optional AMPS plate mount available. NFC: Intergrated NFC Tag latch that Launches free Dock'n Drive Application. If you have any questions about this product by iBOLT, contact us by completing and submitting the form below. If you are looking for a specif part number, please include it with your message.